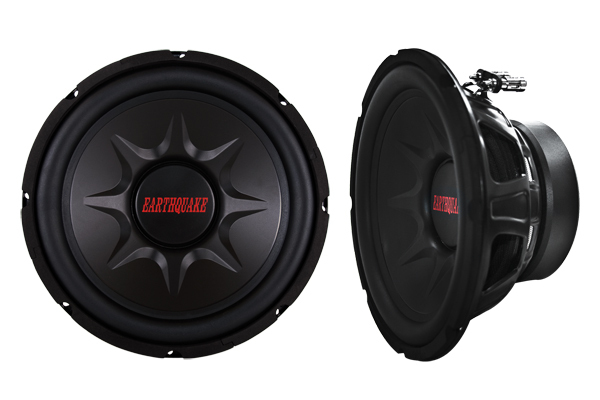 The TNT woofers are the perfect upgrade to your sound system. With beautiful space age polymer cones they are a joy to look at and their articulated sound will enrich your life with quality sound. The TNT voice coil is built with several professional features. The coil itself is made with copper wire.The voice coil former (the cylinder to which the coil is wound) is made ​​of aluminum, not cellulose (cardboard), Kapton ® or fiberglass. The use of aluminum prevents hotspots on the voice coil - due to the superb heat conductivity inherent to aluminum. In essence the entire voice coil becomes one big heat sink. The TNT woofers use double thick high density magnets. The thick magnet allows the woofer to play louder while still sounding taunt and chrisp. The magnet is covered with an aesthetic rubber sleeve. The TNT woofers are equipped with Earthquakes Triple Vent scheme that enhances the voice coil cooling by maximizing airflow. Triple Vent combines the benefits of pole piece venting, voice coil radial venting and Spider venting. Triple Vent lets you play louder and longer.